The Thames River Police Museum is located in what was once the carpenter’s workshop at Wapping Police Station. Situated within the headquarters of the Metropolitan Police’s Marine Police Unit, the Museum offers visitors a unique insight into the history of the World’s first police force. Exhibits include uniforms and documents, which trace the history of the Thames River Police from its inception in 1798 to the present day. There is also a fine collection of the every day “Hardware” of policing from handcuffs to cutlasses. Because the museum is housed within a working police station, visits must be arranged by prior appointment. Visits are normally conducted by the Honourary Curator, a retired serving officer with many years experience of policing the river. The Museum will fascinate those interested in the history of policing or simply anyone interested in the history of the River Thames. enclosing a stamped self-addressed envelope. Anyone wishing to contact the Museum may do so by sending an email to the Hon. Curator. this address. 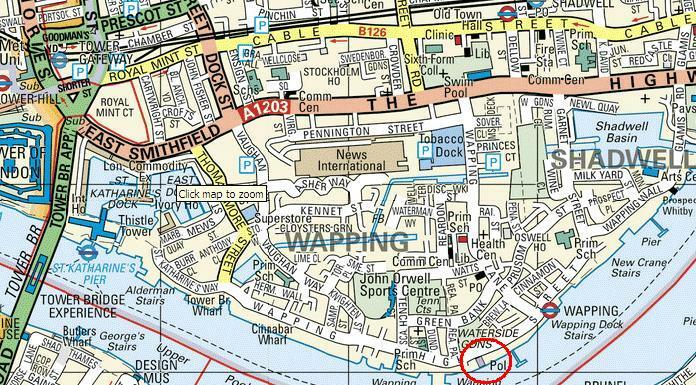 Map showing Wapping Police Station(circled in red).